If you want your tattoo removed effectively, whilst minimising the risks of skin damage and scarring, you should be treated with a high-end Q-switched Ruby or Q-switched Nd:Yag Laser. 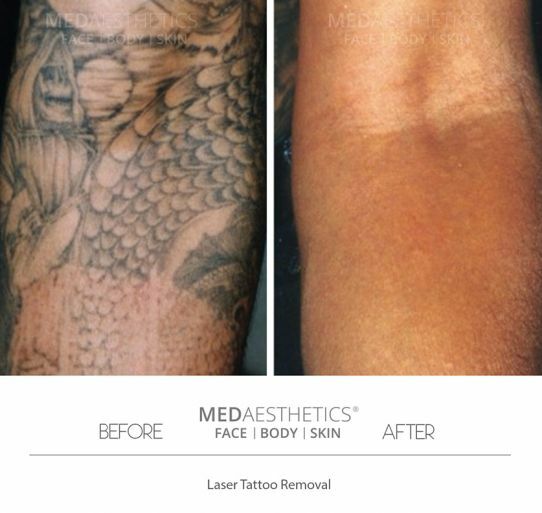 This is the proven method for safe tattoo removalHigh energy Q-Switched laser treatments are the only safe and effective method of tattoo removal in the world at this time. Unlike most other laser devices in the market today, Revlite™ Laser is able to emit 4 wavelengths of laser beams and is therefore able to target the widest possible range of ink colours. In our experience, not all colours respond very well to Laser treatment. Blacks and reds are removed effectively as well as some brown, purple, orange, pink and occasionally yellow ink. Greens and blues are less effective, althought these can be faded by up to 50% allowing a more successful cover up. It has been found that 80-90% of tattoo images are made from black ink.